Known to many as Effy, five-year-old Elizabeth loves being outside and running around with her little brother Harry. She is currently thriving in kindergarten, learning to ride a bike and has decided she wants to be a firefighter when she grows up. This happy, spunky, “old soul” has come a long way. In 2013, her parents noticed a small lump on her ribcage and brought her to the doctor. Soon after, she was diagnosed with acute lymphoblastic leukemia at just two years old. 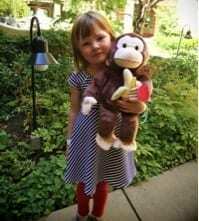 Effy was immediately admitted to Lucile Packard Children’s Hospital, a Family Reach partner, and began her treatment. Right away, Effy was put through a series of painful procedures. Nurses put an IV into her tiny hand and did their fair share of poking and prodding. The family of four faced non-stop appointments and visits from doctors and nurses. They could barely sleep at night in the hospital room. Before Effy’s diagnosis, both parents worked fulltime at a nearby school. Effy’s care requirements paired with Harry’s inability to attend daycare due to the risk of infection forced Jennifer to stop working and take an unpaid leave of absence. The family experienced financial strain and couldn’t pay their mortgage. That’s when their social worker connected with Family Reach. We were able to cover their bill immediately. “They helped us at one of our low points,” says Jennifer, reflecting on this period of her family’s journey. Struggling financially was a side effect of cancer that Effy’s family had never imagined. We helped remove some of this burden and allowed them to focus on Effy, which Jennifer considered an irreplaceable contribution. We’re happy to report that, after three years of treatment, Effy is now cancer-free. Jennifer has returned to work and Effy and Harry are back at school and daycare.